Shot my buck on first day on my friend's ranch, trapped and shot hogs for the next two days. Caught 36 in the traps and shot 6 more while in the blind. Yup, that's a load. The Chevy's kinda squattin'. Kudos. Stacked like cord wood....Well done!!! That is indeed a passel o' pork! You can never have too much ammo — unless you're swimming. That's a lot of pork. Somebody had a lot of skinning to do. Wow. Lots of pork there. Vulture food, or food for you? Some meat for me, some for the coyotes and vultures. 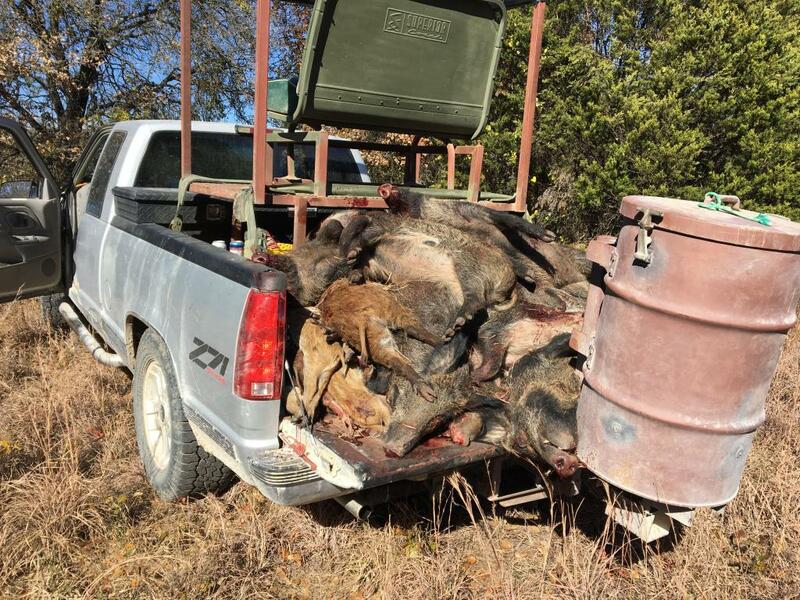 Where were all those hogs taken? Must be A BUNCH in that area. The ranch is a couple hours west of Dallas, very big ranch. They killed over 800 last year. That is a lot of bacon. Great job.